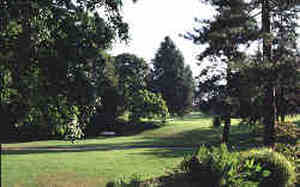 The park was created in the middle of the nineteenth century round a Manor house dating from 1789 using plans by D. Noisette. It was acquired by the City in 1912 when it was still in the open country, but now is an irreplaceable green lung for the West of Nantes. Over the last 30 years, it has been gradually restored and various collections have been developed such as rhododendrons, magnolias, fuchsias, dahlias and heathers. Among many remarkable trees, the most remarkable is the tulip tree Liriodendron tulipifera which is one of the oldest in France. In addition, the park has acquired a number of large plants, such as camellias, magnolias and rhododendrons, which have been rescued from building sites and successfully transplanted. On the boulevard des Anglais side, the fountain in the middle of the ferns has been decorated with statues from the former fish market that used to be at the tip of Feydeau Island. At the top of the park, the four statues symbolising Agriculture, Forestry, Botany and Sculpture come from the former Trocadéro palace in Paris. There are also an art gallery and cafeteria in the former Manor, as well as a roundabout and a rocker to amuse the children.